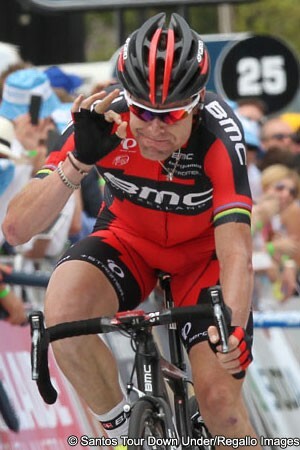 Cadel Evans gave a clear reminder of the ability which earned him a world championship jersey plus the 2011 Tour de France title when he roared to a super solo victory on today’s third stage of the Santos Tour Down Under. The Australian showed well on the first two stages but still found himself thirteen seconds behind day one winner Simon Gerrans (Orica GreeneEdge). However the BMC Racing team rider was far stronger than his younger compatriot on today’s climb of Corkscrew Hill, jumping hard off an effort by Richie Porte (Sky) and going over the summit approximately seventeen seconds clear. Gerrans caught Porte before the top and led the two man chase, but Evans was too strong and held them off on the 7.5 kilometre run in to the line. They were picked up by the chasing group and Nathan Haas (Garmin Sharp) led in the chasing group fifteen seconds back, with Diego Ulissi (Lampre-Merida), Adam Hansen (Lotto Belisol) and Gerrans third, fourth and fifth. “I had an idea of the opportunity I could get on Corkscrew climb and I knew what to do,” said a focussed Evans. “My team did a fantastic job to position me where I had to be. I had been training well but winning is what we are here for. The ten second time bonus plus the time gained saw him finish the day a solid twelve seconds ahead of Gerrans. Diego Ulissi (Lampre-Merida) is a further three seconds back, while Nathan Haas (Garmin Sharp) is 27 seconds behind in fourth. Robert Gesink (Belkin-Pro Cycling Team) and last year’s third-placed finisher Geraint Thomas (Team Sky) are also within thirty seconds, and so must be watched on the remaining three days. Gerrans won the race in 2012 and is hoping to do so again. He accepted that today was a setback for him. “It won't be easy to get back [the time], but it's not impossible,” he said. “It's not going to be easy for Cadel. We're going to throw everything at him, that's for sure. The action was quickly underway after the start in Norwood, with the Australian rider Travis Meyer (Drapac Pro Cycling) attacking very soon after the drop of the flag. He was joined by Jérôme Cousin (Europcar) and then Astana's Andriy Grivko. Last to get across was Trek Factory Racing’s Jens Voigt, who made it four out front. The quartet worked hard but were unable to push their lead out past three minutes. The bunch was reluctant to give them too much leeway and so Gerran’s Orica GreenEdge team tapped along, keeping the pace relatively high behind. At the sprint at Kersbrook (km 39), Meier jumped first and finished well clear of Grivko. The next gallop went to Grivko, who was unopposed when he led Meier, Cousin and Voigt over the prime line in Williamstown (km 53). Cousin was under pressure and slipped back to the peloton shortly after the halfway mark. Meier also faded, while the other two were caught on the climb of Corkscrew Hill. Lotto Belisol and then the BMC Racing Team pushed the pace on the climb and after Richie Porte tried to get a gap, Evans matched and then passed him, kicking hard to shed the Sky leader. Race leader Gerrans couldn’t match them at first, but gradually reeled in Porte and chased hard. Evans went over the top approximately seventeen seconds ahead of Gerrans and Porte. The group behind caught the two chasers on the run-in to the finish, but Evans had enough of a gap to hit the line well ahead. Gerrans said that the climb played a crucial part in the outcome. “The Corkscrew is one of the toughest climbs, especially when it comes at such a crucial part of the stage,” he said. “Everyone is going 100 percent and that was their opportunity to make their mark on the race. Porte had also hoped to win the race, but saw today that he appears to be lacking a little form relative to the new race leader. “Cadel was absolutely flying. I tried to go with him in those hairpins, I couldn't stay with him, and he got away,” he said. “It's a little disappointing, but Saturday is another hilltop finish, I am quite hopeful we have the team to at least get up there on the podium. The Santos Tour Down Under continues tomorrow with a lumpy 148.5 kilometre stage from Unley to Victor Harbor.